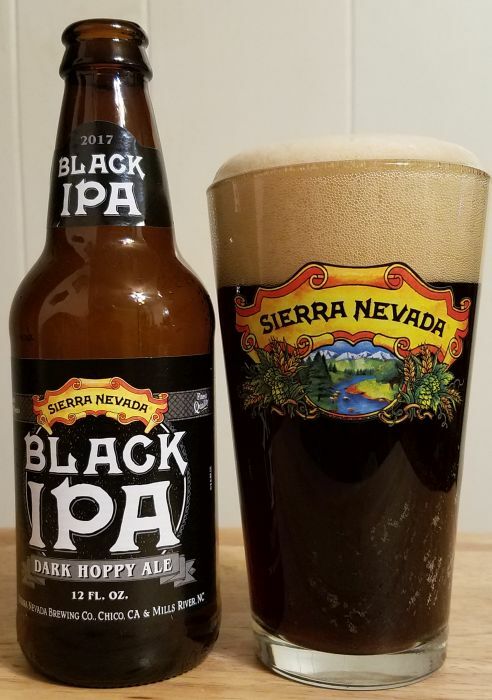 Here's six with an emphasis on Sierra Nevada. Sidecar is an Orange Pale Ale from Sierra Nevada. The orange is very subtle, which is good. Orange is one of those flavors that can ruin a beer if the brewer gets heavy handed with it. This beer pours clear orange/yellow, about the color of SNPA, with a lot of foam and carbonation. The aroma is where the orange comes through strongest, coasting atop something very similar to the wonderful blend of malt and hops that characterizes SNPA. The flavor brings the orange to the background in favor of buttery malt and the expected west coat hop thing. I won’t need to have this again, but I liked this bottle. 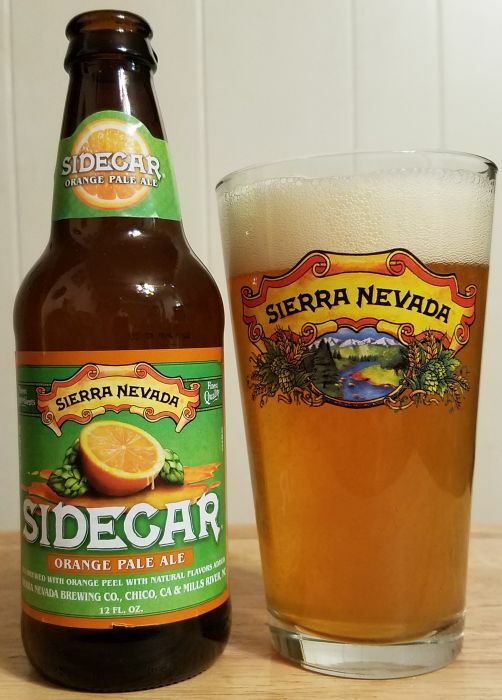 Another example of Sierra Nevada doing the fruit thing right. The peach isn’t a forward presence in Peach IPA, thankfully. The peach flavor just adds a slight, mellow sweetness to the aroma and taste. This is still an IPA. It pours dark golden in color with average to more-than-average foam. The aroma is slightly fruity, but mostly about a classic SN hop profile. The peach is a little stronger on the flavor but still not dominant. 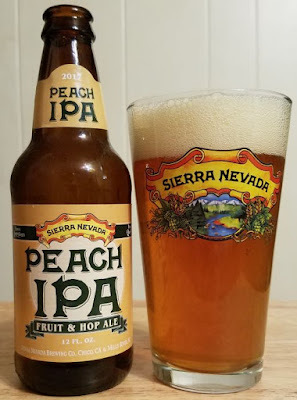 This is a legit IPA that closes with a hint of sugary, mild peach sweetness. I cringe a little bit when I see peaches mentioned on a beer label, but this is better than I thought it would be. 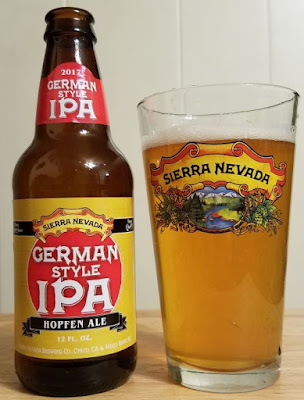 Sierra Nevada's German Style IPA isn’t bad at all, but I think it plays the German yeast card pretty heavily to the exclusion of much IPA quality. Had they called this a hoppy kolsch I'd probably be on board to a greater degree. This beer pours slightly cloudy yellow with average head. The aroma is like a kolsch, or maybe even like a witbier. There are honey notes, maybe berries and bread, kind of a dessert thing. The flavor has that, too... reminds me a little bit of berry cobbler. There is some hop tingle in the finish, but more akin to classic SNPA than any of the brewery’s IPAs. I guess this is alright. By the way, I'm digging the slightly retro look of the labels in the current Sierra Nevada IPA mixed twelve. I got that box mostly looking forward to this Black IPA, because I really loved Sierra Nevada's Blindfold Black IPA a few years ago. This beer is good, but not as good as Blindfold. It pours very dark brown with a lot of foam. The aroma is really nice. It combines a pine hop profile with a rich, dark, pumpernickel type of malt character. The flavor is good, too, and has that same dark bread and tingly hops blend, but it closes slightly thin. I remember loving Blindfold for it’s strong, persistent finish. I don’t think I quite pick up on that kind of distinguishing character here. I swore off lambic five years ago after tasting some variations on the style by the commonly found Lindemans brewery and finding them to be really disgusting. But since then my taste has changed and I’ve come to love sour and tart beers. A member of the staff at a Blacksburg beer store suggested I try Oude Geuze Boon after I told him that I’ve come to love La Folie and some other sours. 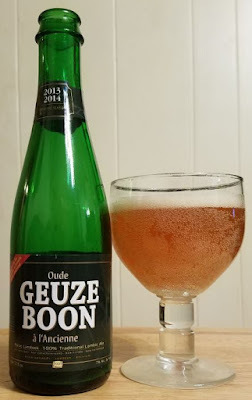 This is a lambic made without fruit at all, and the Gueuze style, to my understanding, is traditionally a blend of two concurrent vintages. This beer pours cloudy yellow with average head. The aroma is great. Like a sour it has a really nice complexity, with tones of sweet citrus, such as pineapple, blending with funky, cheesy notes. The flavor brings all of the stuff on the nose straight to the tongue, although I found the finish to be a little too subdued. It closes rather quietly, and while each last sip invites the first, I’d have enjoyed a little more clamor. Still, when each sip is as good as the previous, it’s silly to complain. 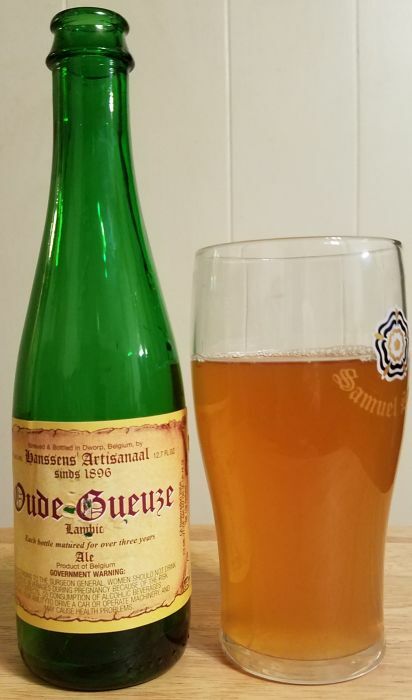 Hanssens Oude Gueuze ppours slightly hazy golden yellow with no head and basically no carbonation. Other reviews mention average carbonation, so I wonder if my bottle just was not properly sealed. The aroma is tart and funky, reminding me of kombucha, sour apples, some hints of the aging. The flavor is very good in spite of this bottle being mostly flat. It is very sour and strong, with pear and citrus and lemon qualities, and the close is bright and pungent. I liked this. OK, so that's two lambic reviews, both of them positive, in a week's time. Hell, the second one was flat and I still liked it. This is a style I need to rethink.